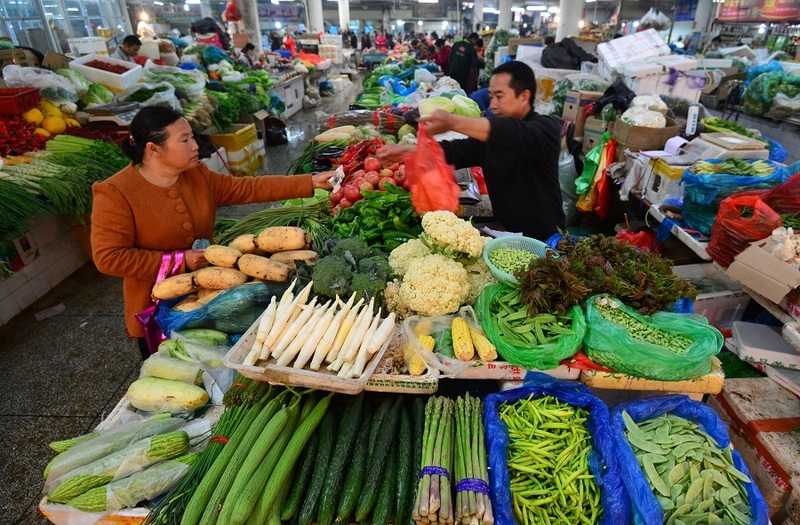 A customer buys vegetables at a market in Fuyang, in eastern China’s Anhui province, May 10, 2016. By Michelle Winglee, who spent a year in Taipei and Beijing studying Mandarin while writing on environment and agriculture-related topics, and now works for the Office of China Affairs at the University of Maryland. This article was first published by Foreign Policy’s China channel, Tea Leaf Nation. Wan Li, a young Beijing professional in her late 20s, is at her desk when her cell phone rings. She picks up. “North entrance?” She confirms. “I’ll be right out.” An electric delivery scooter has just pulled up to Wan’s office with her order of tomatoes and Chinese spinach from Emerald Bay Farm, an eight-acre farm located in the northeast outskirts of Beijing. Though not organically certified, Emerald Bay grows vegetables without the use of chemical fertilizers or pesticides, on land not previously used for industrial purposes, and draws groundwater from the nearby Shunyi mountain range. With a bag of fresh produce in hand, Wan returns to the office with a smile, already eager for the evening’s meal. “You have to do what you can in this environment,” she says, gesturing out the window to a gray sky on a day when pollution has reached “unhealthy” levels according to the U.S. Embassy in Beijing’s Air Quality Index. “No one cares about their health until the moment that they are in crisis, and then it’s too late,” she said. Though the higher prices from Emerald Bay are a deterrence, Wan, like other Chinese 20-somethings and young family households in China’s major cities, has decided the money is worth the promise of better food quality. It’s no surprise that the demand for safer food, which includes organics, has taken off in China. The country’s rapid economic growth over the past 30 years has devastated its environment. A five-year study conducted by China’s environmental ministry in 2014 showed 20 percent of the country’s farmland to be hazardously polluted. Major scandals including high levels of the heavy metal cadmium in rice, exploding watermelons pumped with growth hormones, and the use of the steroid clenbuterol (or “lean meat powder”) to induce muscle growth of pigs have made food safety a priority for many Chinese. A 2016 study by consultancy McKinsey showed that 72 percent of Chinese consumers worry that the food they eat is harmful to their health. One research outfit says the organics market in China has grown 30-fold over the past decade. “I think the whole industry and community [around organics] is growing,” said Chang Tianle, who runs the Beijing Farmers’ Market, originally founded by a group of expat artists in 2010 and run by a handful of volunteers. In her previous work with the Minnesota-based Institute of Agricultural Trade Policy, Chang traveled around China to support sustainable family farms. After attending the Beijing Farmers’ Market’s second meeting, she saw the potential for building trust between farmers and customers—unlike China’s traditional urban wet markets, which usually consist of wholesale vendors, not farmers. Chang jumped in to help with the Farmers’ Market’s outreach on Chinese social media, bringing in a surge of local interest. The Farmers’ Market now has a team of 19 employees that run the weekly market, two community centers that sell produce and conduct consumer education events, a network of 30,000 WeChat followers, and partnerships with sustainable farms across China. Chang estimates that there are now over 100 farms around Beijing alone following organic practices, even if they’re not certified. Certification has been a tricky issue in the organic food market, and China’s own regulatory framework isn’t helping. On paper, China has some of the most stringent standards for organic food in the world, but consumers doubt whether they can trust food regulators, and authorities’ ability to enforce the regulations is anyway questionable. Third-party labeling suffers a credibility deficit, as the dozen-plus organizations in China authorized to administer organic labeling have been accused of uneven oversight, handing out certifications to farms that can simply pay the fee, and informing farms of audits in advance. The confusion surrounding certification hasn’t made it easier for consumers to distinguish what is and is not, in fact, organic. Yang Xu, a biogas consultant in his early 30s, said that he was not happy when his girlfriend came through the door with a bag of groceries marked “organic.” “I don’t think it’s worth it,” he said. “I don’t trust that it’s organic.” Chang worries that with all the products claiming to be organic, consumers are confused about the difference. “I met one woman who said ‘if it’s wrapped in plastic, I think it’s organic,’” Chang said. The food scandals that have plagued China have taught consumers to be skeptical. “A lot of people worry that organic is so expensive, and they don’t know if it’s real,” said Zhang Xiaoji, a parent in Chengdu whose child attends a local private school. Zhang began spending more for higher quality produce when his daughter, now eight, was born. Before subscribing to Sunshine Earth Farm’s seasonal farm share program, Zhang made the 30-mile drive west of town to visit the organic market himself. Now, in addition to picking up his box of produce from the farm, Zhang also rents a plot to garden on the weekends with his daughter. “If I’ve met the farmer and I understand the farm, I’m willing to spend more money,” said Zhang. In one hopeful development, social media—particularly mobile messaging platform WeChat—both spares consumers a trip to the supermarket, and has helped make direct farm-to-consumer communication easier. One farmer said 70 to 80 percent of his sales came through WeChat and Taobao. Farmers selling produce at the Beijing Farmers’ Market make sure that customers can easily scan their farm’s QR code, allowing customers to place orders remotely at any time. One farmer said 70 to 80 percent of his sales came through WeChat and Taobao, another Chinese e-commerce website. Other farms like Emerald Bay rely entirely on WeChat. Small organic farms may be best positioned to solve the trust issue surrounding organics, but they struggle to be profitable. Wang Min, 35, who left an investment job to start an eco-friendly farm in 2012, has seen several young farmers fail due to high capital costs and low scalability. Emerald Bay Farm, started in 2009 by a former government worker, has yet to break even, although its WeChat customer base is now 300 and growing. Chang acknowledges slim profit margins for Beijing Farmers’ Market farmers, which often get reinvested back into their respective farms.